We have had a great start to the school year and are now ready to relax and recharge over the holidays. We wish you the very best over the holiday season, with much joy, laughter, good food and time with your family! See you in 2017! 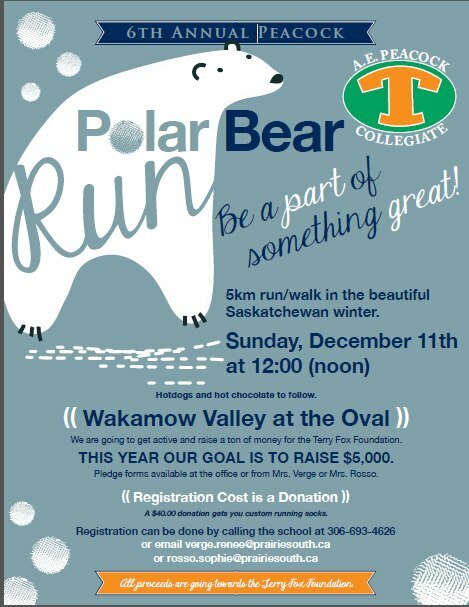 On Sunday, December 11 Peacock will host it’s 6th annual winter charity “polar” run in support of the Terry Fox Foundation. What started as a small group of runners six years ago has evolved into a yearly tradition that is strongly supported by staff, students, and the community. For the past five years the run has raised in excess of $5,000 per year which all is donated towards cancer research. On behalf of the staff and students of Peacock we want to thank everyone who has participated in this important event. We hope to see you on December 11th. Registrations are accepted on site and the run begins at 12:00pm in the Wakamow Valley at the speed skating oval.